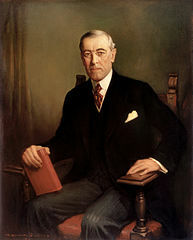 When you hear the name of Woodrow Wilson, the twenty-eighth president of the United States, what do you think of? His 1912 campaign slogan “The New Freedom”? His success in the three-way contest over Republican incumbent William Howard Taft and Bull Moose candidate Theodore Roosevelt? His 1916 campaign slogan “He kept us out of war”? The project of “making the world safe for democracy”? Perhaps the Fourteen Points? The faintly sinister figure of Wilson’s advisor Colonel House or his White House courtship of his second wife? The treaty of Versailles or the League of Nations? The 1919 Nobel Peace Prize? No, I don’t think so. As a habitué of The Science League of America, you probably think of his famous comment, “of course, like every other man of intelligence and education, I do believe in organic evolution. It surprises me that at this late date such questions should be raised.” Good for you. What convinced Wilson of evolution? Probably not his education at Davidson College, Princeton University, the University of Virginia, and the Johns Hopkins University, where he earned a doctorate in history and political science. According to Cary T. Grayson, who served as his personal physician in the White House and wrote a memoir on “The Religion of Woodrow Wilson” after his death, “As an undergraduate in college he was not deeply interested in natural science. His mind was more occupied with political science and with literature. At no time in his life did he read deeply in natural science,” although Grayson added, “He accepted the evolutionary hypothesis, and when he was a young man, about the time of his entrance into Johns Hopkins University and earlier, he was actively interested in it.” Instead, it was probably the influence of his uncle James Woodrow (1827–1907), a leading Presbyterian theologian of his day, whom Wilson regarded as one of the greatest men he ever knew. In his inaugural address as the Perkins Professor, Woodrow announced his intention of addressing points of potential conflict between science and religion. These were mainly geological in nature; 1861 was a little early for the Origin of Species to have started to worry the Southern intelligentsia, especially with the Civil War on the horizon. Clement Eaton, writing in the Journal of Southern History (1962), summarized: “Woodrow stated his belief that nothing would be found in modern science inconsistent with the teaching of the Bible, and he affirmed his belief in the authenticity of the literal word of the Sacred Scriptures. Finally, he made a strong appeal for freedom of inquiry and discussion and declared that in carrying out the duties of the new professorship he would exercise an ‘untrammeled freedom of inquiry.’” Woodrow was later to discover to what extent he was able to exercise that freedom with regard to evolution. Woodrow was slow—and reluctant—to accept evolution, perhaps owing in part to the influence of Agassiz. But he had come to accept the evidence that the earth was ancient, and indeed to have squabbled with fellow theologians about their rejection of it. And he had found that scientists in Europe were accepting evolution en masse. He didn’t take a stand, however, until his hand was forced by the board of directors of Columbia Theological Seminary, which, alarmed by rumors that he accepted evolution, formally asked him in 1883 to explain his views on evolution “as it respects the world, lower animals, and man.” He wasn’t the only academic to run afoul of theologically conservative administrations: as Eaton notes, the geologist Alexander Winchell had been dismissed from Vanderbilt University in 1878, just five years previously, because his polygenist pamphlet Adamites and Preadamites (1878) was insufficiently biblical. The young Wilson was paying attention. In 1884, he wrote to his sweetheart, Ellen Louis Axson, “If Uncle J. is to be read out of the Seminary, Dr. McCosh ought to be driven out of the church, and all private members like myself ought to withdraw. If the brethren of the Mississippi Valley have so precarious a hold upon their faith in God that they are afraid to have their sons hear aught of modern scientific belief, by all means let them drive Dr. Woodrow to the wall.” Wilson was then a recent graduate of Princeton University, when its president was James McCosh, one of the first American religious leaders to embrace evolution, although as a Presbyterian minister he interpreted it as corroborating his faith. McCosh served as president of Princeton University until 1888, with his views on evolution exciting no particular controversy. As for how Woodrow fared at Columbia Theological Seminary, it will be the topic of part 2.